It's time for the 2016 Costume Contest! | Take Back Halloween! It’s time for the 2016 Costume Contest! It’s here, everybody: our 5th annual costume contest! It’s still the same lo-fi contest it’s always been, but this year we’ve added a separate professional division for you cosplay types with your latex and blowtorches and whatnot. For everybody else, haul out your helmets made from tinfoil roasting pans! 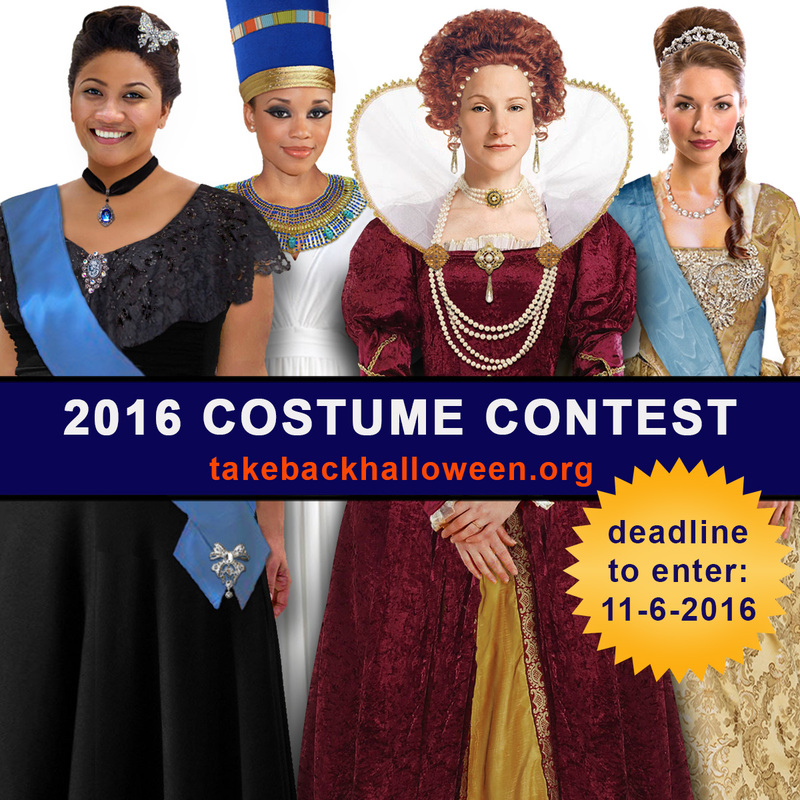 Send your photos to contest@takebackhalloween.org, and we’ll upload all the entries to our 2016 Costume Contest Album on our Facebook page. The deadline for submissions is 11:59 pm EST on Sunday, November 6, 2016. (for existing costumes): Your costume has been exhibited at a cosplay convention or awarded a prize in a cosplay contest; or it is a professional costume used for Renaissance Faire performances; or it is a professional stage costume used for a theatrical performance. (for newly constructed costumes): You are a professional cosplayer, Renaissance Faire performer, or theatrical costumer, and the costume you are entering exhibits a professional skill level commensurate with the uses outlined in #1. We’ve created a couple of special categories for costumes we’d really like to see this year. These are open to everybody, though if we get a lot of submissions we may create Adult, Junior, and Professional subdivisions. In honor of the first U.S. presidential election with a woman at the top of a major party ticket, we’d love to see some costumes celebrating the women throughout American history who have thrown their hat in the ring. You can dress up as anybody from Victoria Woodhull (the first woman to run for president) to Shirley Chisholm (this blogger’s childhood hero!) to Hillary Clinton (pantsuit. wear a pantsuit). There are a bunch more too — Patsy Mink, Belva Lockwood, Margaret Chase Smith, just to name a few. We are planning to add some more costume designs in our Goddess category next season, but in the meantime we’re throwing the floor open for your ideas. If you’ve created a costume for a mythological figure we haven’t done yet (Bastet? Morgan le Fay? Juno? Chang’e?) and it’s a design we could adapt for Take Back Halloween, send in the pictures along with a description of exactly how you put it together. 1. Your costume must fall into one of our four categories: a notable woman from history, a queen, a glamorous star, a goddess or mythological figure. 7. You may enter up to three (3) costumes for consideration. 9. The deadline for submissions is 11:59 pm EST on Sunday, November 6, 2016. We expect to publish the winners about a week after the submission deadline.